I will never forget the day I stepped foot inside my very first Toys R’us way back in the summer of 1982. All I wanted was to get my hands on some Star Wars figures, but my older brother instead dragged me to another aisle that had a bunch of other toys that I had never heard of before called “G.I.Joe”. To be honest, my first impression wasn’t a great one… unlike Star Wars that offered so much variety in their action figures, these bunch of little green army men seemed rather…unimpressive. Nevertheless, I grabbed the first one that caught my attention (a blonde dude whom I assumed was the leader) just to get my brother off my back so he would let me proceed to the Star Wars aisle. It wasn’t until I got back from the store, when I opened my first G.I.Joe when I realized just how much more awesome he was compared to the typical Star Wars figure. With added articulation to the knees, elbows and waist as well as removable accessories like a helmet and visor I was mightily impressed instantly hooked and NEEDED to get more. Fast forward a year later and I had managed to get about half of the original single packed Joes (a few of the original ones came with vehicles and so were a little harder to get) and my Dad came home from another business trip with an amazing gift. 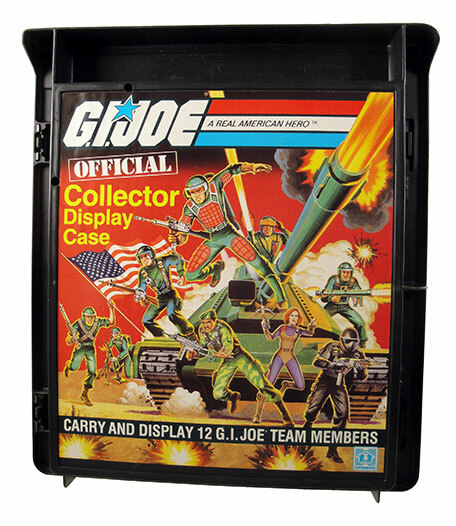 He handed me a square plastic case with a cool G.I.Joe picture in front. At first I had no idea what he had handed me, it turned out to be the official G.I.Joe action figure carrying case and to my delight, it was not empty. When I opened up the case I almost cried! Inside were most of the remaining single packed G.I.Joe figures I didn’t have and I was instantly in kid nirvana! I remember I didn’t get much time to play with them initially since we had to rush off to Sunday mass. But as the mass was going on, all I could imagine were G.I.Joes standing attention on the altar! Anyway, when G.I.Joe was reborn in 2007 with the 25th anniversary toyline, one objective I set out to do was to complete the original 13 members. It wasn’t easy as there were so many other characters that fans preferred and Hasbro aimed to produce but in the end, but over a span of a few years, Hasbro did manage to produce modern updates of all the original 13 and I managed to track them down. To this day, they remain the crown jewel of my G.I.Joe collection! 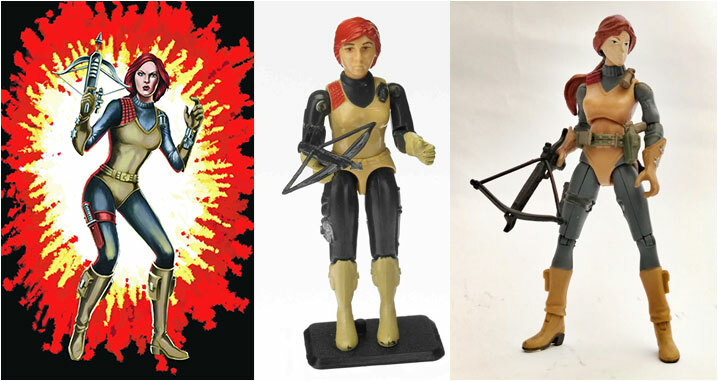 So this was figure zero, the first G.I.Joe that got me started with G.I.Joe. There really isn’t much to say about him though, the only reason I got him was because he was blonde, and back then (thanks to Luke Skywalker) I thought that if a character was blonde, then they must be the leader. Turned out my reasoning wasn’t quite off the mark, I just ended up getting the wrong blonde. Anyway, He wasn’t one of the break through characters from the original 13 (not many of them were), which is why his only modern update was found in a colossal Target exclusive set with a bunch of vehicles I didn’t really care for. So I had to resort to eBay to get my modern Short-Fuze and pay extra for accurate custom web gear that the new version didn’t come with, since he was my first, he just HAD to be accurate to the original. One touch I do like in the modern version is that they gave him glasses, which he was often depicted with in the comic books. OK after I got over the wonder of Short-Fuze, I quickly scanned the back of his card to see what the rest of his team looked like. Flash instantly stood out because he had these bright red pads on his uniform and was hunched over in a cool looking battle pose. It was love at first sight and I immediately identified him as my favorite. Flash was the second Joe I hunted down and added to my collection. Aside from the red pads that easily differentiated him from the rest, his designation as a “Laser Rifle Trooper” made him an instant favorite for so many kids back then. I’m assuming that it was because of this that his modern version was one of the first to be made by Hasbro and one of the first ones I got when I decided to restart my Joe collection. 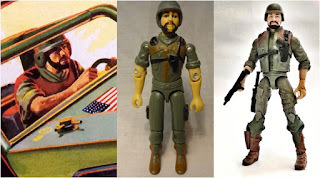 And although he never came out in the live action G.I.Joe movie in 2009, he did get a “movie inspired” action figure, which while quite different, still gives homage to the original figure with red padding. Unfortunately, despite his cool look, he never gained much popularity or exposure outside the one off cartoon episode (where he was voiced by the Frank Welker, the legendary voice actor behind such memorable cartoon characters such as Scooby Doo and Megatron!) and was eventually replaced by a new “laser trooper” a few years later. 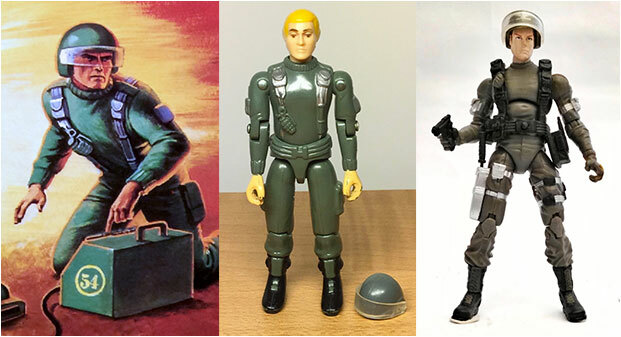 Even if I picked the wrong one, my identification of a “blonde” as leader of the Joes turned out to be right. Before there was Duke, there was Hawk. 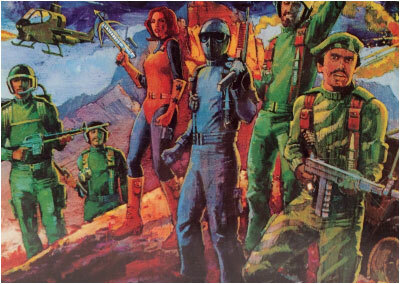 And from the very start Hawk was the leader of the G.I.Joe team. 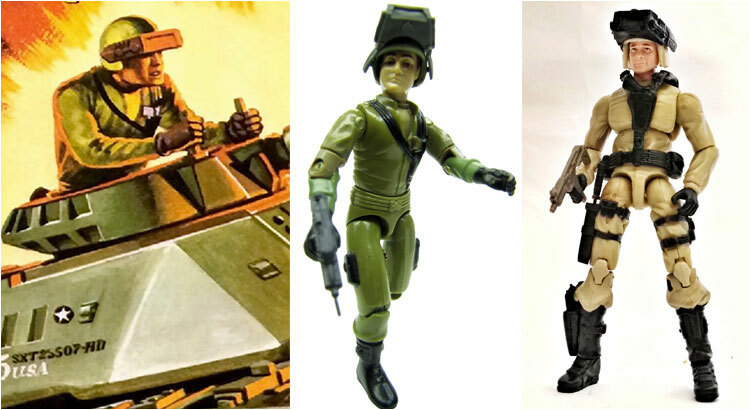 Curiously, despite being the leader, the first Hawk action figure didn’t come single packed like you would think he would, instead, he came packaged with a “vehicle”, the Mobile Missile System. 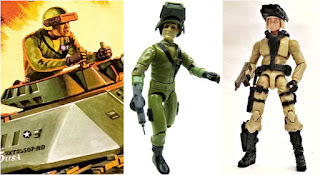 To add to the confusion, the original Hawk and Short-Fuze figures had the exact same head (actually, Flash shared the same head sculpt as well, but had brown hair). This was intentional on Hasbro’s part in order to cut production costs. They used shared body parts and 6 head sculpts for all 13 figures, differentiating each character through paint and accessories. Fortunately when it came with the modern version of Hawk (and the rest of the original 13) he got a unique and more distinguished head sculpt. Interestingly enough, in 1986, Hasbro released a newer version of Hawk promoting him to the rank of brigadier general clearly establishing him as top dog in the G.I.Joe ranks. They also changed his hair color from blonde to dark brown. I’m assuming this was done to make sure no one got him confused with Duke, the more popular field “leader” of the team. For the longest time, it was the strong belief of many toy companies that female characters/action figures just don’t appeal to boys. Because of this, female representation in any toyline was usually reduced to the one “token” female, and for G.I.Joe, Counter Intelligence Specialist Scarlett filled that role. She was the only figure with a completely unique sculpt from head to toe for obvious reasons. And in a rather misguided attempt to really make her unique (or maybe more appealing to boys?) they dressed her up in a very non-military looking uniform that basically was a tan colored leotard and dark leggings. They even gave her a friggin crossbow instead of a standard issue weapon. She looked more like a superhero than a soldier. In any case, her odd uniform didn’t really bother me, what did was her head sculpt which while kinda feminine, looked nothing like her beautiful face on the card art. And what made things worse was that she didn’t have a ponytail as her art hinted at and was depicted to have in the cartoons. Her modern version, though not perfect was a much needed improvement from the original. She still had the leotard and crossbow, but at least she finally had a ponytail! Clutch was the first “vehicle pack in figure” I got. He came with the V.A.M.P. (Vehicle: Attack: Multi Purpose) jeep. I remember finding his description on his filecard quite amusing “He greases his hair with motor oil, rarely shaves, and chews on the same toothpick for months. Clutch still calls women "chicks." Looking back it was quite an interesting decision to include a male chauvinist into a toyline for kids. Anyway, because he was a vehicle driver, I always saw him as a second-class member of the team, not important enough to be sold single carded. As it turns out, while not reaching the heights of popularity as say, Scarlett and Stalker, he did manage to get good exposure in the Marvel comics and cartoon. In every toyline there is THE toy, the centerpiece of a line that everyone wants. 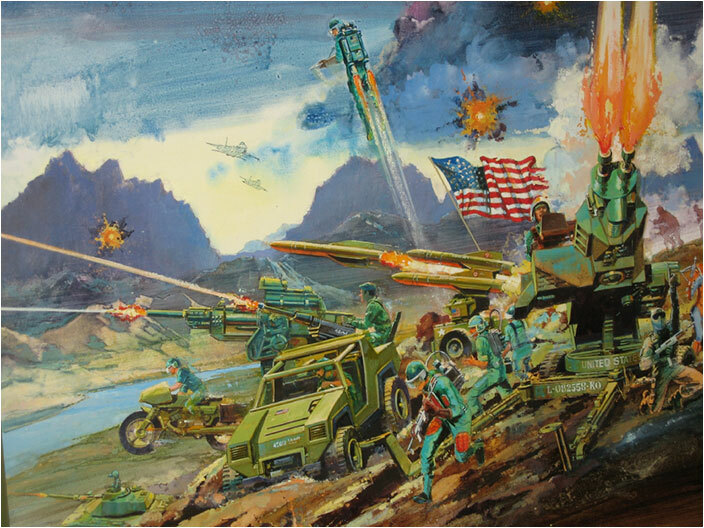 For the first wave of G.I.Joe toys, the Motorized Battle Tank or MOBAT for short, filled that role. As the name suggests, the MOBAT was a battery operated tank that could move on it’s own and roll over unleveled surfaces with ease. And the Joe Steeler with his unique oversized visor was the driver of that motorized behemoth. Unfortunately, I never got myself a MOBAT so I never owned a vintage Steeler. I did manage to get myself a modern version of the guy (still without the MOBAT!) years later off eBay. It’s worth mentioning that in the cartoon, he was “written off” the series in a unique way. In the 2 part episode “Worlds Without End”, Steeler and a group of Joes are transported to an alternate dimension where Cobra has defeated G.I.Joe with most of their members either M.I.A. or dead…. including that world’s Steeler. Then in an odd twist, the Cobra Baroness is revealed to be a double agent for the Joe resistance AND the lover of that world’s Steeler! In the end, Steeler decides to stay in that world to continue the fight against Cobra with the Baroness! Finally, in the current and more mature IDW comic Joe universe, Steeler was revealed to be a deep-cover Cobra agent who was eventually killed by another agent to protect Cobra interests.